Ron Howard knows how to capture the great stories and preserve the knowledge for future generations. I watched In the Shadow of the Moon which is a documentary about the moon landings. Between 1968 and 1972 nine American spacecraft voyaged to the moon. Twelve men walked on the surface and only 24 astronauts have ever seen the earth in its entirety; as a blue and white jewel suspended in the blackness of the universe. 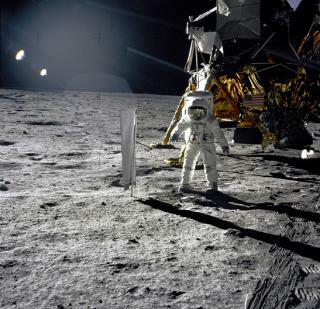 The integrity of this documentary was apparent in its use of actual footage of the Apollo missions and the commentaries in the words of the astronauts. It makes for compelling viewing in its simplicity. It needs no special effects to give it significance. There is no hype. I remember clearly seeing the TV coverage of Neil Armstrong’s first steps on the moon. I was at primary school and remember watching it at school on TV. It filled me with awe and wonder and an interest in space flight and our universe that has never left me. Ron Howard obviously felt that same sense of awe. It is important to record the moments as they occur and then preserve them for the future. It is also a real gift to see and hear the astronauts recall these events, especially now looking back. And it’s imperative to get the dialogue from those interviews recorded before those courageous men get too old. When asked about the popular notion that the moon landings were staged, most replied with amusement pointing out the obvious problems with this thinking. Now just 40 years on and everything we do in our whole world is recorded and edited. It is great to see the creative and thought-provoking work being done by many people. I only hope that the stories of real importance and significance aren’t lost amidst the barrage of superficial nonsense that is out there – much of it being constantly peddled by the paid media on TV.